ItemB-03127 - Machinery at the Ikeda Mine, Queen Charlotte Islands. ItemB-03130 - "Nelson Brick Co., Nelson, BC". ItemF-02225 - An unidentified Nelson store. ItemF-02461 - "Kootenay Cigar Factory, Nelson, BC", Mr. Simms and Sam Bridges in the office. ItemF-02462 - "Kootenay Steam Laundry, Nelson, BC". ItemB-02003 - Freight lying at Thompsons Landing, B.C. Item F-02461 - "Kootenay Cigar Factory, Nelson, BC", Mr. Simms and Sam Bridges in the office. 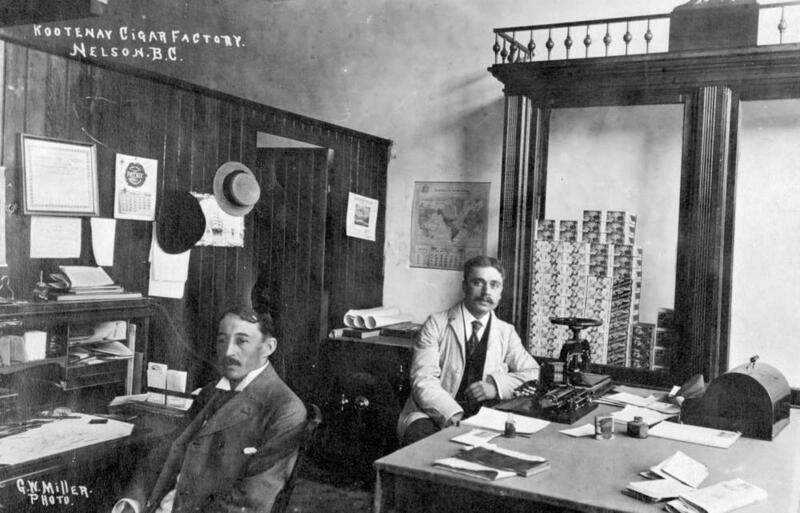 "Kootenay Cigar Factory, Nelson, BC", Mr. Simms and Sam Bridges in the office.